This training hosted by Michael Brown, LMFT, MSC, Happy Couples Healthy Communities. 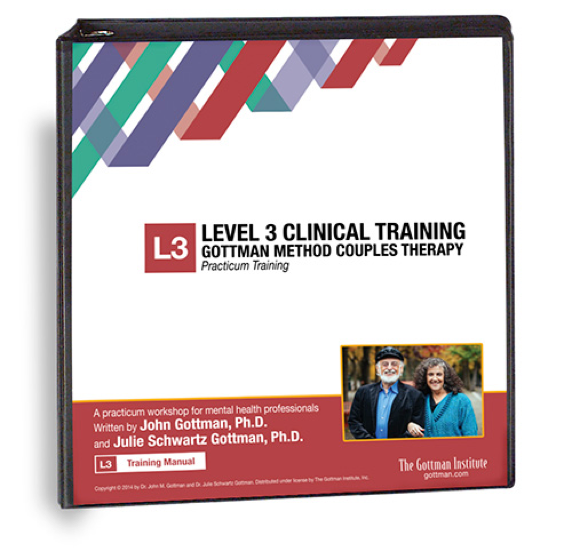 There is no better way to learn how to apply Gottman Method Couples Therapy than the Level 3 Training. This advanced, practicum workshop is only offered in-person. Building on the knowledge obtained from Level 1 Training [link to L1 landing page] and Level 2 Training [link to L2 landing page] you will master how to effectively use the Oral History Interview during a couple’s assessment and understand its implications. You will learn how to clearly explain to a couple their strengths and challenges in terms of the Sound Relationship House, and how to help partners identify their own “Four Horsemen” and understand the antidotes. You will learn how to select and utilize appropriate tools to help a couple deepen their Friendship System. You will learn how to clarify a couple’s conflicts in terms of solvable, perpetual, and grid-locked problems, and use the “Dreams Within Conflict” technique to help a couple feel hopeful and to achieve break-through with their perpetual conflict. Stop the couple’s dyadic interaction when one member exhibits one of the four horsemen. Describe the Four Horseman to the couple. Assist one partner to ask the other partner questions about the dream or deeper meaning embedded in their specific gridlocked issue. Explain the importance of expressing needs in positive terms and instruct the partner to restate their point without criticism and then direct them to resume dyadic interaction. Conduct an Oral History interview with appropriate timing. The purpose will be to use these couples to illustrate how the Gottman Method can be applied to these tough cases. The trainer(s) will describe how they would treat these couples and then participants from the audience will volunteer to role-play these couples with the trainer(s) demonstrating using a variety of interventions with these couples. Participants will then have the opportunity to practice using these interventions in a supportive small group setting with other participants’ role-playing the couples from the videos. Bringing a videotape isn’t required, but it will help make the training more meaningful for everyone. If you cannot bring a taped segment, it would help to bring a brief written description of a challenging couple for the same purpose. This is for Case Discussion within the context of Certification Practicum ONLY and is not related to the videotaped interventions submitted for final Certification Review. Refund, Disclaimer & Cancellation Policy: If you cancel prior to three weeks before the workshop date, a full refund minus a 20% processing fee will be provided. Following the cut-off date, your fee minus a 20% processing fee can be applied to a future workshop. The individual or entity that made the arrangements to attend a Michael Brown, LMFT, MSC event agrees to hold harmless National Marriage Seminars, Inc., its directors, and employees from any and all liability associated with the training and those travel arrangements. By registering for any National Marriage Seminars, Inc. sponsored or hosted event the individual or entity agrees to these terms.